High translocation speed of a DNA strand through a nanopore is a major bottleneck fornanopore detection of DNA molecules. Here, we choose MgCl2 electrolyte assalt solution to control DNA mobility. 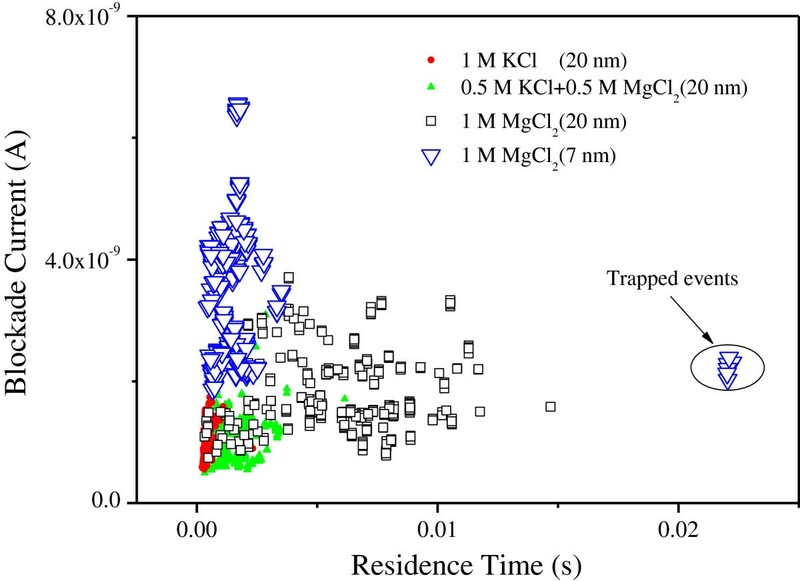 Experimental results demonstrate that theduration time for straight state translocation events in 1 M MgCl2solution is about 1.3 ms which is about three times longer than that for thesame DNA in 1 M KCl solution. This is because Mg2+ ions caneffectively reduce the surface charge density of the negative DNA strands and thenlead to the decrease of the DNA electrophoretic speed. It is also found that theMg2+ ions can induce the DNA molecules binding together and reduce theprobability of straight DNA translocation events. The nanopore with small diametercan break off the bound DNA strands and increase the occurrence probability ofstraight DNA translocation events. Nanopore sensor, which is derived from the Coulter counter , has been utilized for detection and analysis of various single chargedmolecules [2–9]. Now, it is a widespread concern as a potential candidate to achieve the‘$1,000 genome’ goal set by the US National Institutes of Health due to itshigh speed and low cost performance. In a typical nanopore-sensing experiment, ions andbiomolecules are driven by an external transmembrane electric field. Biomolecule passagethrough the nanopore can cause a characteristic temporary blockade in the trans-poreionic current. Information of the biomolecules such as length, composition, andinteractions with other biomolecules can be extracted from the blockade ionic current.In order to get the structural information of a DNA strand at the single base level, abottleneck to break through is to control the DNA translocation speed through ananopore. Intuitively, we can change the applied voltage, salt concentration, viscosity,and electrolyte temperature to reduce the translocation speed . The side effect of this method is the reduction of the signal amplitude,which leads to more difficulties in capturing the very weak ionic current change . Another method is to apply a salt gradient on the electrolyte solutionacross the pore, which can be used not only to prolong the translocation time but alsoto enhance the capture rate . Recently, some groups tried introducing positive charges into nanopores asmolecular ‘brakes’, which is proved to be an effective approach to increasethe attractive force between the negative DNA molecule and the positive nanopore innerwall, thus increasing the duration time more than 2 orders of magnitude . The shortcoming of this method is that the residual ionic current during theDNA translocation is insufficient for direct base identification. Aside from an electricfield applied along the nanopore axis direction, Tsutsui et al. added a transverseelectric field to slow down the translocation speed of DNA across the nanopore . It is reported that adding a transverse field of 10 mV/nm in a goldelectrode embedded silicon dioxide channel can make 400-fold decrease in the DNAtranslocation speed. Similarly, He et al. reported a method to control the DNAtranslocation speed by gate modulation of the nanopore wall surface charges. It is foundthat native surface-charge-induced counterions in the electro-osmotic layersubstantially enhance advection flow of fluid, which exerts stronger dragging forces ontranslocating DNA and thereby lowering the DNA translocation speed. Based on thisphenomenon, they regulate DNA translocation by modulating the effective wall surfacecharge density through lateral gate voltages. The DNA translocation speed can be reducedat a rate of about 55 μm/s per 1 mV/nm through this method [15, 16]. Yen et al. and Ai et al. reported that applying positive gate voltage could also induce DNA-nanoporeelectrostatic interaction, which can regulate the DNA translocation speed. Lately, afunctionalized soft nanopore composed of a solid-state nanopore and a functionalizedsoft layer was demonstrated that can not only increase DNA capture rate by counterionconcentration polarization occurring at the nanopore mouth but can also decrease DNAtranslocation speed in the nanopore through electro-osmotic flow . Stolovitzky's group designed a nanopore with a metal-dielectric sandwichstructure capable of controlling the DNA translocation process with a single-baseaccuracy by tuning the trapping electric fields inside the nanopore [20–22]. This design is verified by molecular dynamics (MD) simulations, but there isno device reported so far due to its difficulty in fabrication. Applying an externalforce in the opposite direction of the electric field force on DNA could control a DNAstrand through a nanopore at a very slow speed. It can be achieved using optical tweezer  or magnetic tweezer  technologies. However, it is hard to extend these methods to sequence DNA inparallel , such as employing thousands of nanopores on a chip concurrently . As we know, counterions in solutions can bind to DNA molecules, which may provide a dragforce on the DNA and reduce the translocation speed. 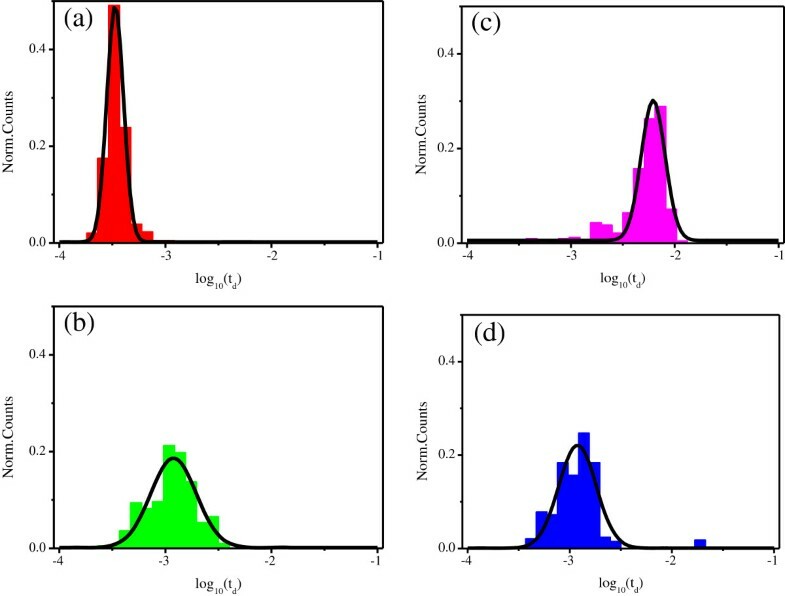 Dekker's group found that DNAtranslocation time in LiCl salt solution is longer than that in KCl or NaCl solutions.Through MD simulation, they elucidated that the root of this effect is attributed to thestronger Li+ ion binding DNA than that of K+ and Na+. The DNA electrophoretic mobility depends on its surface charge density andthe applied voltage. If we can adjust the DNA surface charge density, it is possible toactively control the DNA translocation through a nanopore. It has been found thatMg2+ could reduce electrophoretic mobility of DNA molecule more thanNa+ at the same concentration without worrying about changing the DNAmolecule charge to a positive value . It is also known that Mg2+ is regularly used in adhering the DNAto inorganic surfaces, which may also reduce the DNA mobility. Inspired by the processof reducing effective surface charge density of a DNA molecule and that increasing theattractive force between DNA molecule and nanopore inner surface can retard DNA moleculetranslocation, we employed bivalent salt solution such as MgCl2 to observethe DNA translocation event through nanopores. We hope the two kinds of phenomena occurat the same time, thus extending the translocation time further more. The fabrication process of a solid-state nanopore is shown in Figure 1a. It starts with the fabrication of a 100-nm thick, low-stressSi3N4 window(75 × 75 μm2) supported by a silicon chip usinglithography and wet etching processes. Then, we mill the membrane in a small window withsize of 500 × 500 nm2 to reduce the membrane thicknessto approximately 20 nm. Following the milling process, a nanopore with diameter inseveral nanometers is drilled on the milled region in the Si3N4film. Both the milling and drilling processes are completed by focused ion beams in adual beam microscope (Helios 600i NanoLab, FEI Company, Hillsboro, USA). The millingprocess is used to reduce the nanopore length, which can enhance the nanoporesensitivity to biomolecules. Two nanopores are fabricated with diameters of around7 nm and about 20 nm as shown in the right inset of Figure 1b. The chips with nanopore fabricated on are cleaned in piranha solution andtreated in oxygen plasma for 30 s on both sides prior to use. As shown inFigure 1b, the chip is assembled into apolymethylmethacrylate flow cell and sealed by means of silicone elastomer gaskets . Two Ag/AgCl electrodes are immersed in two electrolyte compartmentsseparated by the chip for setting up a transmembrane potential and detecting thetransmembrane ionic currents through the nanopore. The ionic current is measured at100 kHz with low-pass filtering at 10 kHz using a resistive feedback amplifier(EPC10, HEKA Elektronik, Rheinland-Pfalz, Germany). All salt solutions are degassed,filtered, and adjusted to pH 8.0 using 10 mM Tris–HCl and 1 mM EDTAat pH 8.0 at room temperature. The λ-DNA (48.5 kbp, about 16.2-μm long)we used is purchased from Takara Bio, Inc. (Otsu, Japan) and put in the cis chamber(chamber with cathode). A voltage of 600 mV is applied on the trans side. Allmeasurements are taken inside a dark Faraday cage. The setup of measuring the ionic currents through a nanopore. (a)Schematic illustrations of the nanopore fabrication process and (b) themicrofluidic setup. FIB, focused ion beams; PMMA, polymethylmethacrylate;Ⓐ, electrometer. where σ is the bulk electrolytic conductivity. In this paper, it is set asσKCI = 9.83 Sm−1, σ MgCl 2 = 12.3 S m − 1 at 18°C for 1 M KCl and 1 M MgCl2 accordingto reference . Given the bulk electrolytic conductivity, the open pore conductance for ananopore can also be estimated from formula (1). 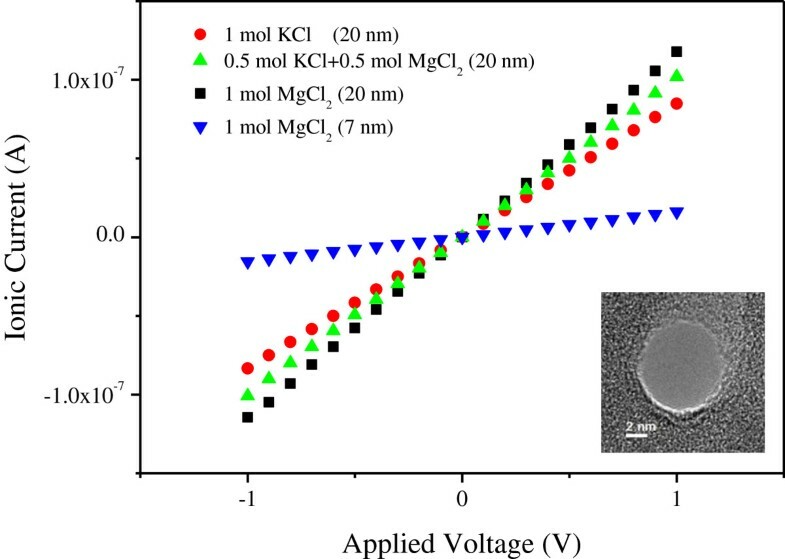 Based on formula (1), it is estimatedthat the open pore conductance for the 20-nm diameter nanopore in the three typesolutions of 1 M KCl, 0.5 M MgCl2 + 0.5 M KCl, and1 M MgCl2 should depend directly on the bulk electrolytic conductivityand the salt concentration. The predicted ratio for the open pore conductance in theabove three solutions is 1:1.13:1.25, which agrees well with the measured value of1:1.19:1.37 extracted from Figure 2. The open poreconductance for the 7-nm diameter nanopore can also be calculated. The predicted resultis 18.56 nS, which is consistent with the experimental results, too. I - V curves for different nanopores indifferent solutions. The inset on the right bottom is a TEM image of a 7-nmdiameter nanopore. where V is the applied bias voltage, and d with DNA = d open 2 − d DNA 2 is the effective diameter of the nanopore with DNA in the pore.According to formula (2), the blocked ionic current amplitude (∆I) islinearly proportional to σ for the nanopore with the same diameter.Therefore, the amplitude of the blockade ionic current for DNA translocation through thenanopore in MgCl2 solution is expected to be larger than that in the KClsolution with the same molar concentration because the former has a high electrolyticconductivity. Unfortunately, the results as shown in Figure 3do not meet such prediction. The 20-nm diameter nanopore produced a little difference inthe amplitude of the blocked ionic current in the three salt solutions (1 M KCl,0.5 M KCl + 0.5 M MgCl2, and 1 MMgCl2). As shown in Figure 3, the red solid circlepoints denote the events for the 48.5 kbp λ-DNA translocation through the nanoporein 1 M KCl solution. The green solid triangle points stand for the events thatoccurred in 0.5 M KCl + 0.5 M MgCl2 solution, and theblack open rectangle symbols stand for the events in 1 M MgCl2 solution.The three symbols almost overlap with the black open rectangle symbols which are locateda little higher. This result tells us that the electrolyte conductivity is only one ofthe factors that affect the blockade ionic currents. Scatter plot of the event residence time versus its blocked ionic currentamplitude. In Figure 3, some outliers we call as ‘trappedevents’ have been observed in 1 M MgCl2 experiments. Although theprobability is small, the duration time of these events is 22 ms, about 17 times ofthe other events in 1 M MgCl2 experiments. As we know,Si3N4 surface in aqueous solution at pH 8.0 is negativelycharged. The correlations between Mg2+ ions on both the negatively chargedDNA and the Si3N4 surface can generate a net attraction force andthen help stick the DNA into the nanopore, but the phenomenon only obviously occurredfor the 7-nm diameter nanopore experiments. This is because the gap between the DNA andthe inner surface of the nanopore is also increased with the increasing nanoporediameter. With the increase of the gap, the net attraction force is not strong enough tostick the DNA, which leads to the trapped events unremarkable in the 22-nm diameternanopore. 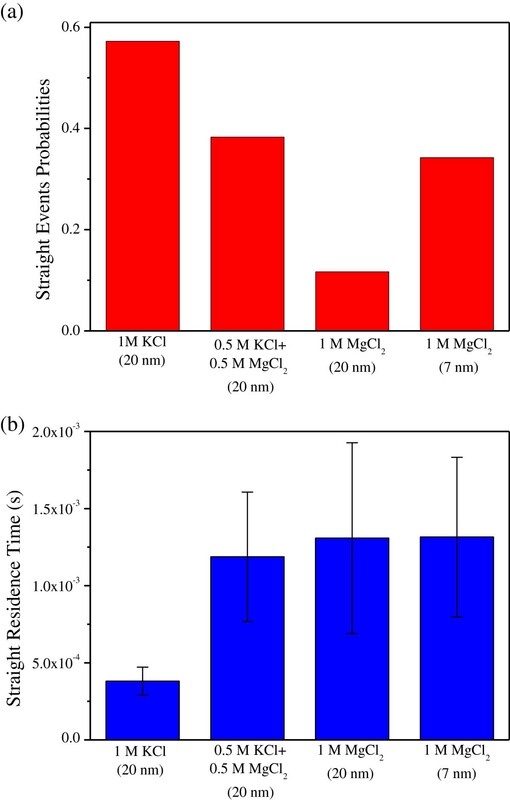 From Figure 3, we find not only the blockade currentamplitude and duration time but also the event point dispersion degree increase with theincreasing Mg2+ ion concentration. In order to further analyze thetranslocation events, we plot the current blockade histograms on a semi-logarithmicscale in Figure 4. There are some peaks in each histogram ofthe current data, and they correspond to different translocation events. We can define avariable N to describe the DNA spatial state, the value of which represents thenumber of base pairs in the cross-section perpendicular to the pore axis. The lowestblockade current value peak is interpreted as a single DNA molecule in the nanopore in alinear configuration . We call such event with N = 1 as ‘event A’.The other peaks correspond to the events of folded DNA molecule translocation or severalparallel straight DNA in the pore, or both. We call those events withN > 1 as ‘event B’. There is only one obvious peakin Figure 4a, and some other discrete points, which is muchlarger than the first peak of the blockade current value. This is interpreted as event Aoccurs with high frequency in KCl experiments. However, due to the relatively largediameter (approximately 20 nm), several DNA strands are also able to thread thenanopore simultaneously or a DNA strand could translocate in a folded state , which may cause a higher blocked ionic current as shown those as discretepoints in Figure 4a. When DNA molecules pass the samenanopore in MgCl2 solutions, it is reflected that there are four peaks inFigure 4b and even five peaks in Figure 4c. This indicates that event B is easy to happen in MgCl2solution. With increasing Mg2+ concentration, this phenomenon becomes moreobvious. Comparing the occurrence number of event B in Figure 4a,b,c, it is concluded that Mg2+ ions play dominant role ininducing several DNA strands binding together or a single DNA strand being folded. In amonovalent salt solution, as shown in Figure 4a, theattraction force between neighboring DNA strands is weak and the event B is seldomobserved. However, in the divalent MgCl2 solutions, event B occurred with alarger number and several peaks appeared obviously in Figure 4b,c. This is attributed to the presence of the Mg2+ ions, whichinduces the attraction force between the neighboring DNA strands. Similar phenomenon isalso reported in reference . With the increase of the Mg2+ ion concentrations, the attractionforce becomes strong enough that it can make the formation of minor-grove-to-minor-grovebound state for DNA molecules bridged by Mg2+ ions. In the 1 MMgCl2 electrolyte, thermal fluctuations can only transitorily increase theinter-DNA distance but cannot break the bound state . So, event B with N = 4 is more often observed inFigure 4c. This implies that more DNA strands can be boundtogether or a single DNA strand is folded with many sections induced by the highconcentration of Mg2+ ions. However, the bound state can be broken off byreducing the nanopore diameter. As shown in Figure 4d, thenumber of peaks is reduced to two for the DNA passing through a 7-nm diameter nanoporein the 1 M MgCl2 solution. With the decrease of the nanopore diameter,the bounded or folded DNA with more than two sections (N > 2)has to be broken off or pulled straight to thread through the small aperture. Current blockade histograms in different experiment conditions. (a)In 1 M KCl solution for the 20-nm diameter nanopore, (b) in the mixedsolution with 0.5 M KCl + 0.5 M MgCl2 for the20-nm diameter nanopore, (c) in 1 M MgCl2 solution for the20-nm diameter nanopore, and (d) in 1 M MgCl2 solution fora 7-nm diameter nanopore. Figure 5 displays the duration time histograms in alogarithmic scale. Solid curves are the Gaussian fit to the histogram. Figure 5a shows the residence time peak at 0.36 ms, butFigures 5b,c respectively show peaks in 1.21 and6.19 ms for the same diameter nanopore. The duration time increases with theincrease of the Mg2+ ion concentration. As we know, the net charge of a DNAmolecule sensitively depends on the valence of counter ions . K+ and Mg2+ ions all could reside in the negativelycharged pockets formed by phosphate groups of the DNA backbone. However, Mg2+ions bond stronger and last longer than K+ ions. Therefore, the net charge ofDNA molecules in MgCl2 electrolyte is lower than that in KCl electrolyte.With the decrease of the surface charge density in DNA strands, the DNA electrophoreticmobility will be reduced under the action of the same external applied voltage, thusincreasing the translocation time. Comparing the translocation time betweenFigure 5c,d, it is found that the translocation time forDNA strand through the 7-nm diameter nanopore in 1 M MgCl2 solution isabout 1.19 ms, much shorter than the duration time of 6.19 ms for the DNAstrand through the 20-nm diameter nanopore in the same solution. The only differencebetween the two cases is the nanopore diameter. It is reasonable that event B is themain cause of the longer average duration time, as shown in Figure 5c. Event B refers to several types of DNA spatial states in translocating ananopore. One type is a single strand DNA translocating through a nanopore in more thantwo folded states. In this case, the length of the two-folded or more than two-foldedDNA should be shorter than its straight state, and it will cost shorter time totranslocate through the nanopore. Event B also includes several DNA strands bindingtogether to pass through the nanopore. When the bounded DNA strand passes through the20-nm diameter nanopore, the drag force on the DNA strand coming from the nanopore willbe strong and extends the duration time. It is easier for several bounded DNA strands topass through the 20-nm diameter nanopore than through the 7-nm diameter nanopore; thiswill extend the averaged duration time for the 20-nm diameter nanopore. The duration time histograms in a logarithmic scale. 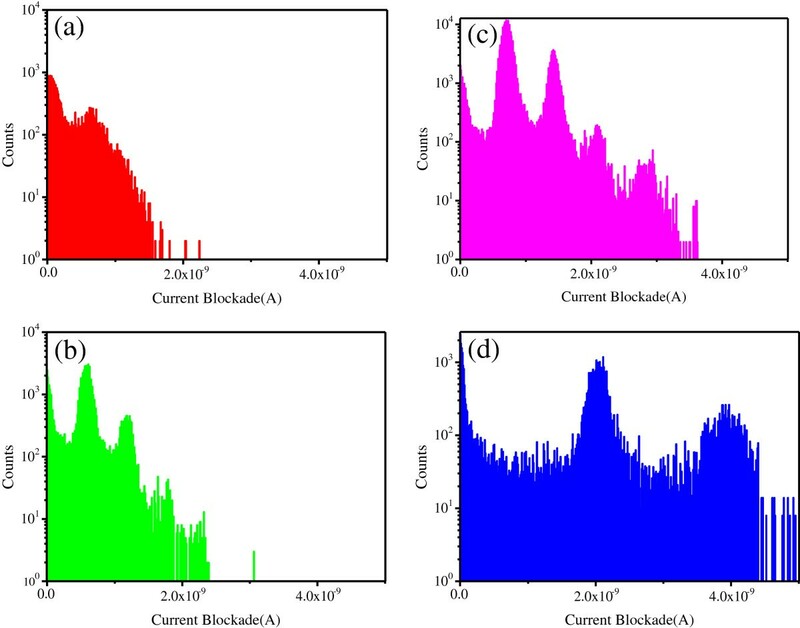 (a) In 1 MKCl solution for the 20-nm diameter nanopore, (b) in the mixed solutionwith 0.5 M KCl + 0.5 M MgCl2 for the 20-nmdiameter nanopore, (c) in 1 M MgCl2 solution for the 20-nmdiameter nanopore, and (d) in 1 M MgCl2 solution for a 7-nmdiameter nanopore. In fact, we are more interested in the average translocation time for event A. So, wedistinguish event A from B, and then give the happening probability and the averageduration time of event A. As shown in Figure 6a, for the20-nm diameter nanopore, the probability of straight translocation events falls sharplyin an electrolyte rich in Mg2+ ions. This phenomenon is consistent with ouranalysis, but it is disadvantage for DNA detection and analysis. However, aperturereduction can raise the probability of DNA molecule straight translocation event from11.7% to 34.3%, which may ease this problem. From Figure 6b,we can see for the 20-nm diameter nanopore that event A averaged duration time alsorises with the increase of Mg2+ ion concentration, as we expected. It is1.31 ms for 1 M MgCl2 solution, about three times longer than thatfor the same DNA in 1 M KCl solution. We also found that the translocation time forthe 7-nm diameter nanopore is 1.32 ms, almost the same as that for the 20-nmdiameter nanopore. So, we can conclude that the translocation time of event A does notdepend so much on the diameter of a nanopore. Straight state translocation events. (a) Probabilities in differentexperiment conditions. (b) Average residence times in different experimentconditions. In summary, the duration time for DNA translocation through a nanopore can be extendedwith the use of MgCl2 electrolyte. The side effect is that Mg2+ions may induce more DNA strands binding together, which is harmful to do DNA sequencingin MgCl2 electrolyte. Reducing the nanopore diameter can effectively reducethe occurrence number of the folded DNA translocation events. So, we can say thattheMgCl2 solution is a good choice for nanopore DNA sequencing experimentsif nanopore diameter can be reduced further. YZ is a PhD candidate of Mechanical Design and Theory at the School of MechanicalEngineering, Southeast University, Nanjing, P.R. China. He is interested in nanoporefabrication and nanopore biosensing. LL is an assistant professor of Mechanical Designand Theory at the School of Mechanical Engineering, Southeast University, Nanjing, P.R.China. His research interests are biomolecule sensing and biodegradable materialsdesign. JS is an assistant professor of Mechanical Design and Theory at the School ofMechanical Engineering, Southeast University, Nanjing, P.R. China. Her research interestis micro-nano fluidic device design. ZN is a professor of Mechanical Manufacture andAutomation at the School of Mechanical Engineering, Southeast University, Nanjing, P.R.China. His research interests are minimally invasive medical devices and microfluidicdiagnostic device design and manufacture. HY is a professor of Mechanical Manufactureand Automation at the School of Mechanical Engineering, Southeast University, Nanjing,P.R. China. His research interest is advanced manufacturing technology. YC is aprofessor of Mechanical Design and Theory at the School of Mechanical Engineering,Southeast University, Nanjing, P.R. China. His research interests cover heat transfer,tribology, micro-nano fluidics, and micro-nano biomedical instrument. The authors thank the financial support from the National Basic Research Program ofChina (2011CB707601 and 2011CB707605), the Natural Science Foundation of China(grantno.50925519), and the research funding for the Doctorate Program from ChinaEducational Ministry (20100092110051). YZ and YC designed the experiments. YZ carried out the total experiment and participatedin the statistical analysis. ZN, HY, and YC guided the experiment. YZ, LL, JS, ZN, andYC discussed the results and co-wrote the manuscript. All authors read and approved thefinal manuscript.